Filene's Basement's balance sheet reflects a company in trouble. 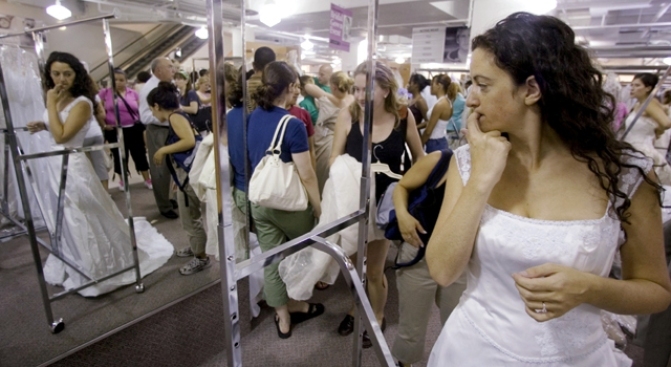 Calling all brides, bride-zillas and those who like to watch cat fights -- the annual Running of the Brides at Filene’s Basement's State Street location goes down on Friday. It's an event not to be missed, whether you’re engaged yourself, or just looking for pure entertainment. Brides-to-be will be storming the store at 8 a.m., with many brides camping outside the store overnight to score a sweet spot at the front of the line. Why all the madness? Designer dresses without the sticker shock, all on display for one day only. When the dresses are gone, they’re gone, hence the desire to be there early for first dibs. But you can’t just show up there on Friday with no plan and expect to conquer the space. You have to have a strategy in the works. Visit Filene’s Running of the Brides web site for tips on how to snag your dream dress, and tips on how to prepare beforehand. Our favorite suggestion has to be "wear a sports bra or swim suit so you can change in and out of gowns anywhere in the store. Yep, no waiting in line for a dressing room here, just strip on site and get the job done. And after a morning full of complete and utter chaos (which has been documented in past years on You Tube, we might add), head to White Chicago, where they're hosting “Breakfast with the Brides” immediately following the mad dash. If you didn’t find your gown, or got a little battered and bruised in the process, grab a little bite to eat and peruse some more gowns in a less hostile environment.